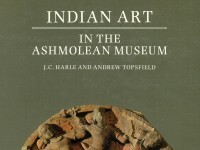 A catalogue of the Ashmolean’s collection of Indian art by J. C. Harle and Andrew Topsfield (published Oxford, 1987). Through the ages, terracotta has been formed the medium for some of India’s most important and beautiful sculpture (see, for exmple, [EA1972.45, EAOS.50, EAOS.50A and EAX.215]). One distinctly Indian type, although probably ultimately derived from western Asia, is the small upright plaque bearing a single moulded figure, usually a woman, or more rarely a couple, man and woman (mithuna). The so-called “Oxford plaque” is the finest and best preserved of these plaques which have been found at many sites in northern India, from the north-west to Bengal. The female figures are distinguished by certain common features of dress; a huge bi-or tri-cornate headdress, the large bolster-like ear-rings and the massive tubular bracelets. Strangely enough, these articles of dress appear on contemporary metal effigies on women [EA1973.7] but never on stone reliefs. The Oxford terracotta is also exceptional, in that both the exact location and the time of its finding, in 1883, are recorded, long before similar but fragmentary examples surfaced in excavations in the same area near Calcutta after World War II and revealing by their identical style that here was a distinct Bengali sub-style. The beauty of this plaque lies largely in the exquisite fineness of detail made possible by impression on a faultless matrix of well-levigated clay. After impression by the mould, doubtless also of terracotta, details like the rosettes on the ground were added by poinçon and the lines indicating drapery scratched on. Some of the detail, such as the deer and makara buckles on the sash across the figure’s torso, while perfectly executed are so small they can hardly be seen by the naked eye. A makara is a mythical monster [see EA1971.13]. Aesthetically, there is a curious contrast between the figure’s plump and sensuously modelled arms and her stick-like legs, while the general air of barbaric splendour is quite outside the mainstream of Indian art. Various identifications have been proposed for this and similar figures. One of these is a yaksī, the female counterpart of a yaksa or local godling. 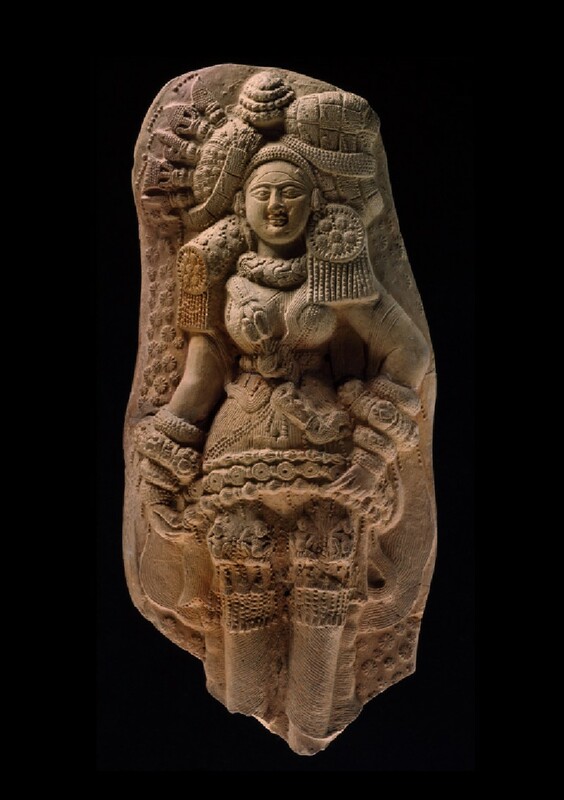 At one level high-born ladies of the time and it is known from stone reliefs that male figures without any particularly distinguishing attribute could represent Hindu gods or great figures of early Buddhist story. On the other hand, it is possible that they represent mother-goddess, whose cult was widespread; their veneration at a popular level would account for the large number of these plaques. A terracotta of a pregnant woman (seated) wearing a bi-cornate headdress from the north-west in the Peshawar Museum further suggests such an identification. Terracotta moulded plaque. Exceptional for its elaborate ornament and fine detailing, this famous terracotta was discovered in 1883 in a river bank at Tamluk, the ancient sea port of Tamralipti on the Bay of Bengal. A semi-divine female nature spirit.